Twilight Time pulls no punches with the cover art for their new release of 1947's Kiss of Death. Much like TT's cover art for their encore edition of The Big Heat, which obliquely and cheekily hints at that film's most infamous violent moment, the uncomfortably zoomed and cropped Kiss of Death cover immortalizes the moment where psychopath Tommy Udo throws Pete Rizzo's wheelchair-bound mother down the stairs. Spoiler alert? Not necessary. At this late date, this setpiece is the best-known aspect of Kiss of Death. The scene is also terribly effective, even if (and, arguably, especially if) you know what is coming. 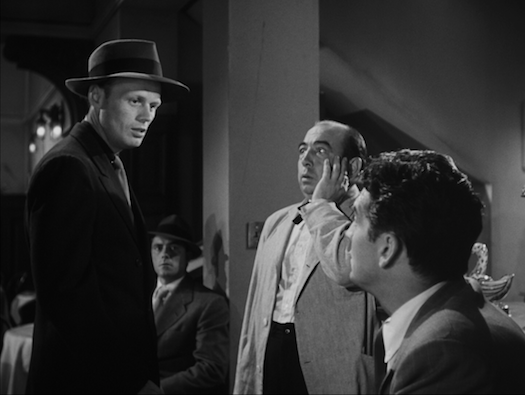 Richard Widmark, in his star-making role, is the vicious killer Tommy. Affecting an overbite, which allows him to visibly flail his tongue in and around his teeth, Widmark turns Tommy's face into that of a vicious rodent. Like the best movie bad guys, Tommy Udo is most unsettling when he appears to be happy, smiling and laughing through that animalistic mask. Sadly, Tommy gets only a fraction of the screen time that an iconic character like this deserves, but one can hardly fault the filmmakers for hedging their bets on withholding such a monstrous character, since the tone of the film is more reserved and realistic. Dubbed a "docu-noir" in the Blu-ray's bonus features, Kiss of Death does not eschew stylization entirely, but it mostly strives for gritty verisimilitude, as evidenced by the almost exclusive use of location shooting in New York City. 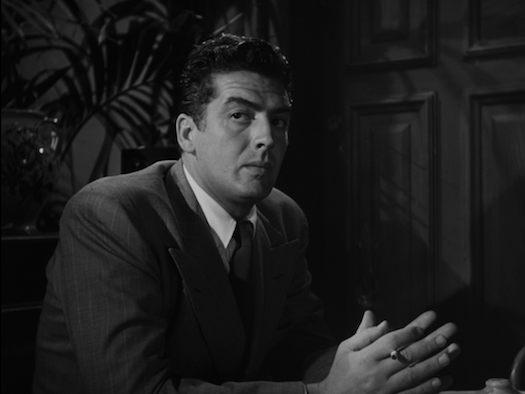 Victor Mature is our flawed hero, Nick Bianco. Deep down, Nick is a good and moral guy who has been forced by circumstance into a life of crime. When Nick gets grabbed for a failed jewelry heist, he dutifully buttons his lip about the other guys involved and does his time. When he learns that his wife has punched her own ticket, and that his two young daughters have been sent to an orphanage, Nick realizes that his colleagues have not looked out for him like they should. He begrudgingly decides to turn stool pigeon so that he can see his daughters again. Brian Donlevy (The Quatermass Xperiment) is D'Angelo, the Assistant District Attorney who convinces Nick to turn squealer. When D'Angelo inevitably brings Nick back in to dig up dirt on that psycho Tommy Udo, he claims it will be the last thing the law will use Nick for. Despite Donleavy's history of playing characters with, er, malleable senses of honor and decency, D'Angelo actually keeps his word. Basically. Nick starts a new life in a new town, with his daughters and a new wife (the disconcertingly girlish Coleen Gray), but he's not out of the woods yet. D'Angelo needs Nick to testify against Tommy Udo in court. Needless to say, all does not go to plan, and before long, Nick starts taking measures to make sure his wife and daughters don't end up like Pete Rizzo's late mother. Viewers may walk away from Kiss of Death just remembering Widmark's delirious baddie, but the whole cast -- including Karl Malden in a billed bit part -- does strong work here. The script by Ben Hecht and Charles Lederer (Ride the Pink Horse) is reliably sharp and lean, and doesn't skimp on well-drawn characters. Director Henry Hathaway (The House on 92nd Street) knows how to set up a tense sequence, such as the early jewel robbery or the big climactic showdown, but he also has the patience not to rush through the quieter scenes either. Mature and Grey get relatively few scenes to flesh out their romance, but Hathaway lets these scenes breathe, investing their potentially unsavory relationship (getting married so soon after his wife's suicide!?!) with some sympathy and palpable emotional stakes. Kiss of Death comes in a limited edition of 3000 copies. As usual, a booklet featuring a liner note essay by Twilight Time's Julie Kirgo is included. A beautiful restoration serves as the foundation for this AVC-encoded 1080p 1.33:1 transfer, which boasts a rich, filmic look. Contrast is subtle and nuanced, and the blacks are deep and inky. This is especially noticeable once the film gets a little more traditionally "noir-ish" with low-key lighting in the late going. I've read online that there are a few minor moments of artifacting throughout, but nothing caught my eye or disturbed me. Similarly, the soundtrack is nicely restored for the DTS-HD MA 2.0 mono audio mix included here. Dialogue is clear and understandable. Director Henry Hathaway relies more on atmospheric effects than music to create a mood, but the score by David Buttolph is full and dramatic when it needs to be. Some crackle and noise, but it adds to the "gritty" flavor of the flick. Two audio commentaries - Two different historian tracks, with the Twilight Time home team, Julie Kirgo and Nick Redman, on the first and film noir specialists James Ursini and Alain Silver on the second (in a track carried over from the 2005 Fox DVD). There's some overlap between the two, but the TT crew tends to focus on the history and background of the actors, while Ursini and Silver talk a lot about the "docu-noir" style and the themes, especially the allegorical Christian significance throughout. Isolated Music Track - David Buttolph's music in DTS-HD MA 2.0 stereo. A great new restoration of a film noir classic. Richard Widmark's gleeful psychopath is iconic and unforgettable, while Victor Mature's soulful lead performance proves he was more than just a handsome beefcake. Highly Recommended.